This prize giveaway is closed. Thanks for playing. Welcome to the Show Me the Stamps Holiday kick off! For this month’s hop, several of the Gina K Designs Illustrators have brought together their design teams and guests. Each illustrator’s design group has fun and exciting things to share using their stamps. You might have noticed that I said “Holiday kick off” instead of just blog hop. That’s because this month is special. As you may know, we don’t always have a prize each month, but this month is one that we do! The Gina K Designs Illustrators want to help you celebrate the holidays in style with some Gina K Design stamps! For this month’s hop, we will be giving away a $50 gift certificate to the Gina K Designs store! All you have to do to enter is leave a comment on each of the Illustrators blogs. Become a blog follower of any of the illustrators and leave a comment letting them know you did. That’s up to 8 chances to win if you become a follower of each illustrator and leave a comment!! Of course, you’ll want to check out the blogs on the designer list below, too. Why? Because I will personally be sending out a surprise gift to someone who comments on their blogs as well. First, I paired October's Stately Flowers 5 mistletoe and sentiment with one of my bestsellers from the past, Festive Frame. Aren't they lovely together? I stamped the frame in Rich Cocoa on Kraft cardstock and colored with Copics R22, R29, E13, E57, and G99. Mistletoe is stamped in Memento Pistachio, greeting in Rhubarb Stalk, cut with a Spellbinders Decorative Oval die. I added pearls to the poinsettia centers and card base is Pure Luxury base weight White. Next I used the Mistletoe image again stamped in Memento Cottage Ivy on Pure Luxury Jelly Bean Green, and used a white Picket Fence marker to color the berries and CopicYG06 to darken the leaves. TIP: Use a 3/4" circle punch to create a chain of 6 openings in the green panel to stamp "kisses" inside ("under the mistletoe", you know??) :) Hold the punch facing up so you can see where they will overlap as you punch. After punching (this is such a fun look and easier than having to adhere 6 punched circles!) place your white layer underneath and stamp the letters from Lots of Letters in Memento Cottage Ivy, Bamboo Leaves, and Lady Bug, alternating the colors. Then pop up the green layer over the white with pop dots. Love how these white round openings mimic the berry clusters. Finally, add some bakers twine and buttons.Card base is Pure Luxury Red Hot. Finally, I had to share something with Pretty Patterns, one of my latest personal favorite sets and one I had in mind for coordination when I designed Lots of Letters. See how pretty the framed letters look nested into the stamped chevron borders? And the greeting: hee hee! Just showing you some uses for numbers, not just for dates! I used Memento Angel Pink, London Fog, and Rose Bud on Pure Luxury White. Card base is Pure Luxury Smoky Slate. When you get done be sure that you hop on over to the blogs of these Gina K Design illustrators to see what their designers have cooked up as well. Deadline to enter for the gift certificate drawing is 5PM Central time on Thursday. November 15, 2012—release party day! AND just in time for someone to do some exciting release party shopping when the new stamps become available at 7PM! Check back here before the release party to find who the prize winners are and see the full reveal of my latest stamp set--Lots of Letters! ALSO!! Be sure to come back Thursday too because the Gina K Designs Illustrator Team will be hopping again sharing a peek at our sets before the party. But this time we will be showing you peeks from the NEW stamp releases! My stamp sets you'll see in today's hop! Love your work...love the Kisses card, so neat. OOooo cant wait to get my hands on the new stamps! Your designs so rock...im just in awe with the one on kraft...wowza! LOVE that you showed the versatility of the mistletoe stamp with your two cards! Thanks for the chance to win! Oh my! These are amazing. I love the new peeks of your Lots of Letters set. Gorgeous the way you combined with Festive Frame. Love!!! I really LOVE these! The Kisses card is just so adorable! BTW, yours is the BEST mistletoe I have seen EVER! Hugs! Love all your Stately Flowers and this new set is probably my favorite. Just love the first card shown - absolutely beautiful poinsettias and really like the mistletoe in with the sentiment. So much eye candy this morning by all those participating - wow. Ohhhhh FABBY designs!!! Love them!! Great bunch of ladies too!! I'm of course a follower for a while!! I just love all your cards. They are truly stunning & inspirational. Love the 'negative' die-cuts! As usual, your work is awesome and so wonderfully done. I always like your stamp sets you design. Love all the ideas using the mistletoe. Great ideas. Oh my Melanie, all three cards are beautiful! My fav is the kisses card, I love how you used the negative space for the letters. LOVE the samples. You are so creative. AND I already am a follower of you! Always love your work, thank you so much for sharing!! Lovely!!! You can tell some time was spent on these. I love all the different ideas for the lettering. Love how you combined the past and present stamps. And the reference pictures are great. The cards are wonderful, and I am trying to stretch my internet capabilities to become a follower. But StampTV is always a leading edge company! I love a lot of your stamp sets. I can't wait to get my hands on the letters.The card with the cheverons is awesome. Great cards and sets, I especially like Pretty Patterns. can't decided whether I like the traditional or contemporary card more. Nice samples and the "Kisses" card is very fun. Thank you. Gorgeous creations.....how do you do it!? Beautiful job on all of these and the stamps are all so pretty! How could anyone not fall in love with your projects! I love all your mistletoe cards and the stately flowers? no words for them, just the utmost!! Thank you for all the beautiful and hard work you put into this website. Your new stamps are so gorgeous. I love the state flowers! Your cards are amazing. I really want the set with the wagon. I was going to try to pick a favorite out of the 3 you've posted (can't). Like them all. Yes, I am following your blog. Great cards! The first looks very vintate - love it! And the kisses with the cutouts is such a cute design. Love your Stately Flowers and Holiday Basket stamps, they are so versatile. Beautiful cards. Melanie, as always, your ideas are lovely and great idea springboards for me. Your "ura10" card is especially appealing to me. Love all the designs! Thanks for the inspirations! Melanie, you are amazing. Your cards are beautiful and I love your stamp sets, they are gorgeous. I am loving your latest Stately Flowers set with the mistletoe. Your work is so awesome. I love the kisses card. The Festive Frame works great with the floral oval die. I love the mistletoe. I've been a follower for some time. When blogger was causing so many issues, I signed up with friend connect, so I guess you could say I'm a two time follower - but at least I don't miss anything. And yes, I am a happy follower of your blog! Lovely creations as always Melanie! I think my favorite is your kisses card, such a fun & unique way to use punches! Excited for the release of your new alphabet too! What fun & beautiful cards! I have the Perfect Patterns set and haven't yet inked it. Great inspiration to get me started! Loving the alphabet stamps! Can't wait for those because there's so much you can do with it! Thanks for always inspiring us! Wonderful cards--my favorite is the first one--it is so elegant. I'm already your subscriber. Let me tell you, the first card took my breath away (mistletoe & festive frame). I've never seen the festive frame before. Love it. Wowzers! Such beautiful work you do! Your creations always amaze me...I am already a follower of yours. Absolutely love your traditional card. Love the effect of stamping and colouring on the kraft cs. Also love the layered effect and the soft colour you chose for the mistletoe - just love the whole thing. Became a follower. I love your cards, ideas and the stamps. I just became a follower and look foward to seeing more of your ideas. Wow! Great projects and I'm in love with the Beyond Baskets stamp set! A while back, I discovered your site, and immediately became a follower, via Google Reader. EVERYTHING you do is gorgeous and inspiring, and these projects certainly fit that description to a "t." My favourite = kisses. Adorable, heart-warming and just ear-to-ear smile inducing! Thank you for sharing and inspiring. You just have so many neat ideas. Gets my creative juices flowing. Great cards. Am follwing. Wonderful, I really like how you did the punching and lettering. I love all of your stamp sets, I think they are all beautiful and wonderfully drawn. The Kisses Card is my favorite, I love the colors, they match my tree! Melanie, I love all of your stamps. Your artwork is stunning! Thanks for sharing these projects with us. I just became a follower, too. That festive frame is beautiful! Your color choices for all cards work well together for each. Beautiful cards love the details and the blending of your colors are perfect. the added blending adds that Special touch thanks for sharing and Iam a follower of your blog. I'm following your blog now! I love your creations! Beautiful cards! Great idea, the circle chain for the Kisses. Love the pink and gray color combo. Joined in following your blog today, I have been a fan of your work for a long time. Fun cards! Love the stamps, love the cards! The poinsettia card is elegant and the other one is so colorful and cheerful! By the way, I am following you on Pinterest! These are all so cute! Love the Kisses card! The KISSES card definitely caught my eye. Love the different designs of all your cards...you are amazing! My oh My!! LOVE your elegant framing on the kraft!! Your poinsettias are simply stunning!! And the mistletoe silhouette in the bg is fabulous!! Then there's that super creative and charming "kisses" card!! How super clever and fun!! LOVE it!! Of course the chevrons with the letters....uber fantastic!! 3 A-M-A-Z-I-N-G creations!! love both cards! Great idea to use circle punch to shoe off letters. love the coloring of pointsettas and mistletoe. great sets. such lovely and rich-looking cards! punching out the circles as frames for the lettering is very nice. Look at all the comments - so many!! I love how you mixed the colors of the alphabet up in your cards! And, of course, the pearls!!!! BEAUTIFUL cards! Beautiful stamp sets, too! I also just joined your blog! Oh, Melanie your work is so versatile! Love the idea of punching out the words! Love how rich your first Poinsettia card is so pretty. love the stamps. I really like the kisses card. These are beautiful I love your fun uses of the sentiments! Oh my Melanie, three fabulous cards! I especially like the KISS one, that green cardstock stands out beautifully. I've got your Festive Frame set and love it! Thanks for a great opportunity to win a nice prize. I'll be signing up to receive your blog as soon as I hit the "send" button on this. Your poinsettia card is gorgeous! Love the colors, the frame, everything! Can't wait!!!! The stamps are beautiful!!! Love your cards. Love your creativity. I am now a follower of your blog. Love your blog and card designs and the articles about your faith, friends, and family. What a great way of using letter stamps! I am always wondering how to use the alphabet stamps that I have. Thank you for the idea! Awesome cards. Just love, love the 1st one on Kraft with the frame. Love how you made the "Kisses" card and chevron is a new biggie for me. Wonderful work. Melanie, all three cards are total works of art!! Love the punched out circles, must try that!! All the inspiration from this hop is just awesome. Has given me lots of ideas. Thank you!! Love the cards, the punched one is a fun one. Am already a follower. Beautiful cards, I especially like the kisses card. Your cards are great. Love seeing your work! Love your cards! As always, your projects are such an inspiration. Love your newest Stately Flowers 5 stamp set! Great cards and stamps, love the flowers. TFS. i LOVE LOVE LOVE the state flowers stamps. Gorgeous cards, Mel. Love your blog and your work. Your flowers always blow me away! Wow! Both cards are wonderful and so very different! Love the traditional take and then the fun contemporary pop of color! The kisses card is my favorite! I've been a follower for a long time! Gorgeous cards, great stamp sets! Your team did a wonderful job showcasing your stamp sets. Thanks for inspiring and a chance to win. Awesome projects! You are one of my favorite designers and I just can't wait to see what you come up with next! Love the nesting of the letters beside the chevron border - great idea that looks fabulous! Absolutely gorgeous...I am now a follower. Beautiful cards. The flowers are wonderful. Your are so creative. Thanks for sharing your talent. Your work is beautiful. My absolute favorite of the three is the first one, the Christmas card. Your Stately Flowers sets are really incredible! Also, I am now a follower! Your cards are so inspiring! I can't wait to get to work! Love your cards. They are beautiful. The kisses card is absolutely adorable. I love the warm feeling the kraft paper gives & what a great idea to punch the circles out instead of gluing then individually! Clever. Beautiful cards...love the elegance of the first and graphic look of the last two. I love it when you stamp on kraft cardstock! I must try that, but first I need to get my hands on some!! :) All your cards are amazing! I am already subscribed to your blog!! Love these fun, fun cards! 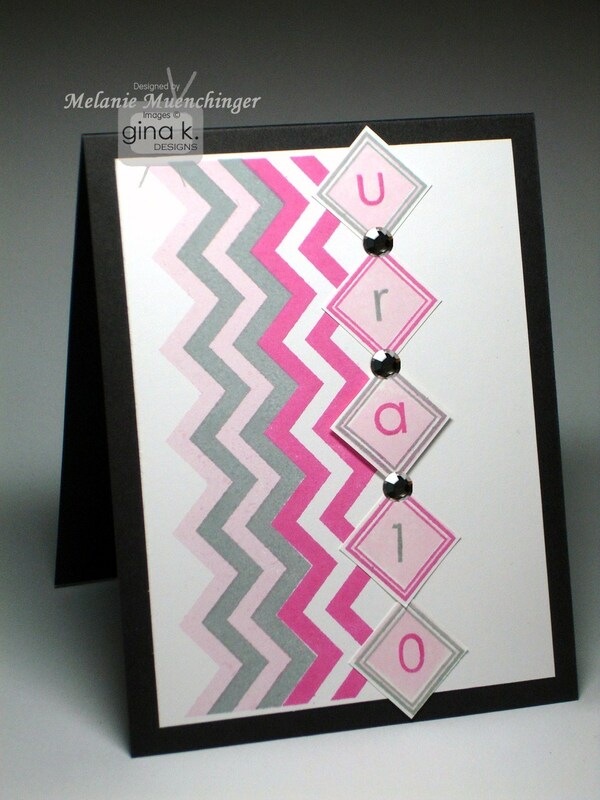 Those zig zags or chevrons are super cute! Of course I am a follower and have been for quite some time! Cutting the holes for the letters in kisses was a great idea! It really makes it unique. The green color also gives it a fresh look. Your flower stamps are quite beautiful as well. Wowzers Mel!! They are all stunning!! Love the letters, especially the "Kisses" card!! Fabulous sets! I love to color and these are perfect. And your cards are gorgeous! I am now following your blog, thanks! Melanie, I always like the colors you choose. Thanks.